Am I too old to start Karate? Are the classes large – how many people are in it? Do you have a belt system and what do the colours mean? Do you have beginners-only classes? How fit do I need to be to start Karate? How long before I can use my Karate skills? I have back, shoulder, knee problems … can I still do Karate? What are the injury risks for Karate? What can I expect from Traditional Okinawan GoJu-Ryu Karate – what are the benefits? What do I wear? Do I need a Karate Gi? Where is your Dojo and when are your classes? What is a Traditional Martial Art? 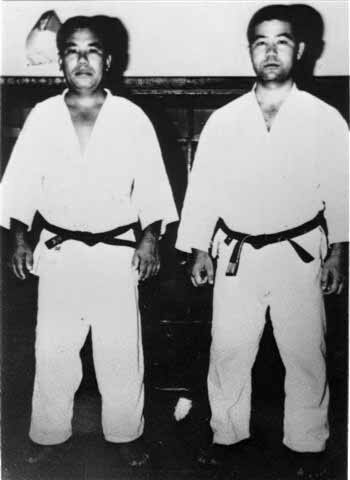 Sensei Anichi Miyagi was one of the original students of the founder of the Okinawan Goju-Ryu Karate style, Chojun Miyagi. In Okinawa, Anichi passed on his wealth of knowledge to Morio Higaonna, who then went on to expose Goju-Ryu Karate to a larger audience by founding a dojo in Tokyo, the famous Yoyogi Dojo, which was instrumental in popularising this style all over the world. Thus, Goju-Ryu Karate is a style of very pure, undiluted lineage, and today many exponents of Traditional Okinawan Karate Do aim to maintain the art in the way performed by Sensei Anichi Miyagi. This picture shows Sensei Anichi Miyagi (left) and Sensei Morio Higaonna (right) at the famous Tokyo Yoyogi Dojo of Sensei Higaonna. Between these two masters of Traditional Okinawan Karate comes a wealth of knowledge that is now passed on to students all over the world. In Australia, this includes most notably Sensei Graham Ravey (8th Dan) and Sensei Terry Lyon (6th Dan). In 2009 Miyagi Anichi Sensei passed away at the of 78. Sensei Terry continues to train and teach the knowledge that has been passed down in an unbroken line.